So uh.. 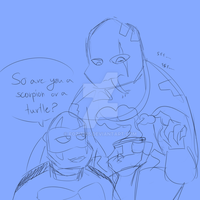 I love ROTTMNT and I love the dark turtles from TMNT: Fast Forward. 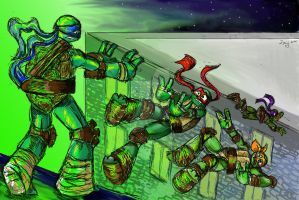 So I grabbed a few reptiles mushed together ROTTMNT and TMNT:FF and BOOM.. Thus these babes were made. I obviously kept the eyebrows Donnie has and the luscious THICC bushes Dark Raph has on his face. I decided to make them lizards because 1. I could not find actual turtles that looked like them and 2. lizards are cooler lmao. I just felt like all these species were perfect for them. So hope you like em!! Love them! This makes so much more sense than the forms in 2k3.